Owner-occupancy or home-ownership is a form of housing tenure where a person, called the owner-occupier, owner-occupant, or home owner, owns the home in which they live. This home can be house, apartment, condominium, or a housing cooperative. 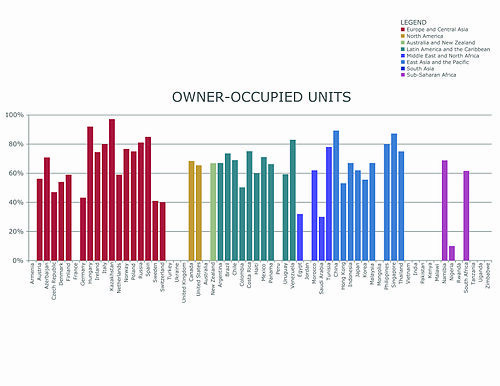 In addition to providing housing, owner-occupancy also functions as a real estate investment. Some homes are constructed by the owners with the intent to occupy. Many are inherited. A large number are purchased, as new homes from a real estate developer or as an existing home from a previous landlord or owner-occupier. A house is usually the most expensive single purchase an individual or family makes, and often costs several times the annual household income. Given the high cost, most individuals do not have enough savings on hand to pay the entire amount outright. In developed countries, mortgage loans are available from financial institutions in return for interest. If the home owner fails to meet the agreed repayment schedule, a foreclosure (known as a repossession in some countries) may result. In several government-run home sale programs, such as those run by the U.S. Department of Housing and Urban Development, owner-occupants are given preferential consideration on bids offered; some programs such as "Good Neighbor Next Door" are limited to certain professions who are required to be owner-occupants. Home ownership gives occupants the right to modify the building and land as they please (subject to government, homeowner association, and deed restrictions), protects them from eviction, and creates a right to occupation which can be inherited. In some jurisdictions, it also confers certain legal rights with regard to abutters. Houses and the land they sit on are expensive, and the combination of monthly mortgage, insurance, maintenance and repairs, and property tax payments are sometimes greater than monthly rental costs. Buildings may also gain and lose substantial value due to real estate market fluctuations, and selling a property can take a long time, depending on market conditions. This can make home ownership more constraining if the homeowner intends to move at a future date. Some home owners see their purchase as an investment and intend to either sell or rent the property after renovating or letting the house appreciate in value (known as flipping if done quickly). Compared to renters and absentee landlords, owner-occupiers are sometimes seen as more responsible toward property maintenance and community concerns, since they are more directly affected. Traditionally home-ownership has been encouraged by governments in Western countries (especially English-speaking countries) because it was thought to help people acquire wealth, to encourage savings, and promote civic engagement. However the housing market crash of 2008 in most of the English-speaking world has caused academic and policy-makers to question this logic. Homeowners are usually required to pay property tax (or millage tax) periodically. The tax is levied by the governing authority of the jurisdiction in which the property is located; it may be paid to a national government, a federated state, a county or geographical region, or a municipality. Multiple jurisdictions may tax the same property. In most Canadian provinces home purchasers must pay a one-time tax called a Property Transfer Tax (Land Transfer Tax) which is based on the cost of the home. ^ "Shelter, or burden?". The Economist. 2009-04-16. Kwak, Nancy H. A World of Homeowners: American Power and the Politics of Housing Aid ( University of Chicago Press, 2015). 328 pp.